The song is written in 1969 by musicians known as Delaney & Bonnie and Friends, that include Delaney and Bonnie Bramlett, Leon Russell, Eric Clapton, and others. The song was called "Groupie (Superstar)", and recorded and released as a B-side to the Delaney & Bonnie single "Comin' Home" in December 1969. 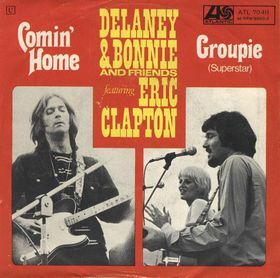 Released by Atlantic Records, the full credit on the single was to Delaney & Bonnie and Friends Featuring Eric Clapton. This version comes in live album of Joe Cocker's Mad Dog and Englishmen in August 1970, the song's name was "superstar" without (groupie). The live album reaching number 2 in Billboard pop album chart and the people started to become aware of the song "superstar". The song in this album was sung by ex-Delaney and Bonnie vocalist Rita Coolidge that was a backup vocalist of Mad Dog and Englishmen in the US tour 1970. Richard change the lyric because the subject in the previous wording is a risque to the clean-cut image of Carpenters. It was said also that the previous wording had kept many other artist from recording it. The song also had been covered in many other artist other than mentioned above. But it's just the radio and you're not really here. And I can hardly wait to sleep with you again. What to say to make you come again ? Come back and play for me your sad guitar.